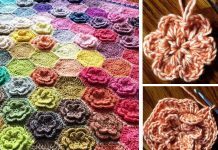 Granny Blanket with Flower Crochet Free Pattern is a great project to make a Traditional Granny Blanket. This pattern is impressive, unique and timeless. 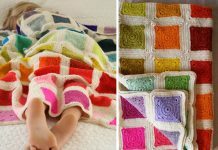 It has a beautiful yellow flower in the middle of the blanket, and the color combination used in this pattern is very suitable for baby blankets. It will be a great gift to your family especially the newborn. 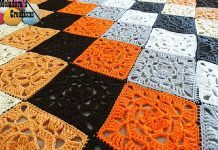 Thanks Joanita Theron for sharing this free crocheting pattern. The link for the free pattern is provided below photo. Happy crocheting.